However, I’m having a hard time working out another tree. 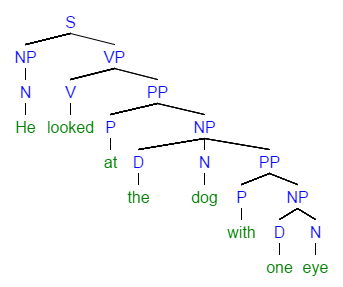 The phrase with one eye could either be attached to the dog or else directly to the verb phrase (and thus mean that ‘He’ has only one eye). 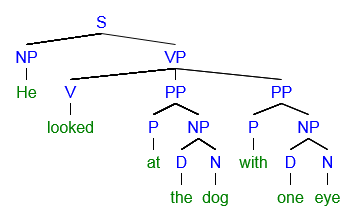 It seems to me that in order to represent the second meaning in a syntax tree, VP → V (PP) (PP) would have to be a rule in the grammar. That removes the ambiguity, but alters the word order. One must conclude that diagramming with such strict rules cannot accurately represent English sentences — or at least, it exposes any ambiguity. Consider the sentence "He looked at the chair with one eye". 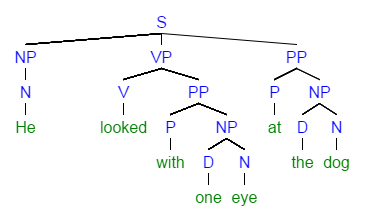 Chairs do not have eyes, so the phrase "with one eye" must qualify "looked", just as "at the chair" provides its indirect object. Surely that requires a diagram including VP → V (PP) (PP). Thus the initial premise which assumes VP → V (PP) (PP) is not a rule is false. VP → V (PP) (PP) is a valid rule. Also, I'll remark that the phrase structure rules you were given are remarkably sloppy -- we have to guess at exactly what they mean. If you treat look at as a transitive verb (which it is; the at is a dummy), even these rules work fine. Check these out at http://mshang.ca/syntree/. He slowly, painstakingly engraved the new lines. He gave the new design a cursory examination. Not the answer you're looking for? Browse other questions tagged ambiguity prepositional-phrases linguistics syntactic-analysis parsing or ask your own question. Is there a program that will parse sentence syntax? What is the equivalent in English of the French sentence part “complément de phrase”? How would you analyse the following sentence on the level of syntax? How do I parse the phrase “it stands to reason”? How do I decide which to choose syntax tree to parse a sentence? Can two nouns appear together in a sentence without a punctuation or a conjunction?